The Bureau of Alcohol, Tobacco, Firearms, and Explosives (ATF) is planning to ban a popular rifle cartridge for political reasons, and has banned a certain accessory for the rifle (Sig Sauer SB-15 arm brace), all using specious logic. I believe that this is President Obama’s retaliation for his 2013 gun control agenda failing and part of his promised ‘executive action’ revenge against the firearm industry and gun owners. Specifically, this is regarding the ATF’s sudden attack upon a very popular rifle and a cartridge for this rifle. The weapon in question is the civilian version of the M16/M4 rifle in use by our military, known as the AR-15, including (and especially in this case), its ‘pistol’ versions. These cartridges are not pistol caliber bullets--they are rifle cartridges that are fired from a weapon, that for legal reasons, is called a pistol. 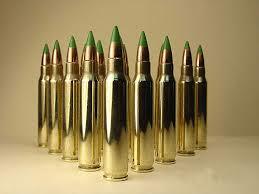 The ATF wants to ban regular rifle ammo that is cheap and plentiful by granting it the misnomer of ‘rifle’ ammo. The ATF has issued a “Framework For Determining Whether Certain Projectiles Are ‘Primarily Intended For Sporting Purposes’ Within The Meaning of 18 U.S.C. 921(a)(17)(C),” which essentially declares that the steel tip, a small bit of steel over lead, makes it armor piercing, and that since certain AR-15 rifles are classified as pistols because of political/legal reasons, it is handgun ammo. The ATF is taking comments until March 16, but from past actions, it’s fairly clear that soliciting comments is merely pro forma. The ATF is proposing to ban certain types of 5.56mm ammunition for the most popular rifle in America, the AR-15. The cartridge in question is the M855 round, which the ATF is lumping into a category of armor piercing handgun ammunition. Oddly enough, this round was replaced in the US military because it was criticized as having too little penetration and failed to stop enemies. Other cartridges with similar properties would be banned. I will briefly explain why this is an erroneous classification and a gross abuse of bureaucratic power. The bullet, in this case the M855 and others like it, is nothing more than a standard bullet with a small bit of steel added for increased performance. It was not specifically designed to be armor piercing, but to incorporate that property with such military requested improvements like increased range, better stability in flight, and improved accuracy. Additionally, being lead-free and mostly copper, it is environmentally friendly. Federal law bans armor piercing handgun ammo, based on hype that criminals were obtaining dense metal bullets, versus soft lead ones, called ‘cop killers.’ In fact, most rifle bullets will penetrate the soft body armor most police officers wear. When it comes to hard arm plates, often used by SWAT teams, these 'armor piercing' rounds are no serious threat. These ‘cop killer’ bullets were first manufactured in the 1960s for police officers who needed a handgun bullet (think the familiar 9mm and .45 calibers) that could penetrate car doors and walls better than the standard bullets they were using. Because these new bullets were made of metals much harder than lead, like steel, they damaged the barrels and had to be coated in your non-stick kitchenware Teflon. In the 1980s, media hyped these bullets as ‘cop killers’ that could pierce the soft body armor then just beginning widespread police use. Black Talon was a name thrown around in these propaganda pieces. These bullets were never sold commercially, but states and Congress was so frightened that such bullets were banned in 1986. "(i) doesn't seem to fit: the neither the projectile nor its core are 'constructed entirely' of any of the metals named. The M855 core is lead and steel, not just steel. "(ii) doesn't fit either: the M855 isn't designed or intended for use in a handgun, its jacket is less than 25% of the weight of the projectile, and it's debatable whether .223 can be called 'larger than .22 caliber.' (if the bore is expressed in hundredth of an inch, as here, the larger next step would be .23 caliber)." During the fracas with Russian over the invasion of Crimea, the ATF also banned Russian surplus ammunition for the AK-74 series rifle, the 7N6 5.45mm cartridge, as armor piercing. It was found that there existed one commercially available pistol firing this round, itself a conversion of rifle, just like the AR-15. This article explains how this framework could be expanded to other calibers, having a chilling effect on the right to keep and bear arms. The AR-15 ‘pistol’ is nothing more than the civilian version of the M16/M4 rifle with the full automatic capability removed. 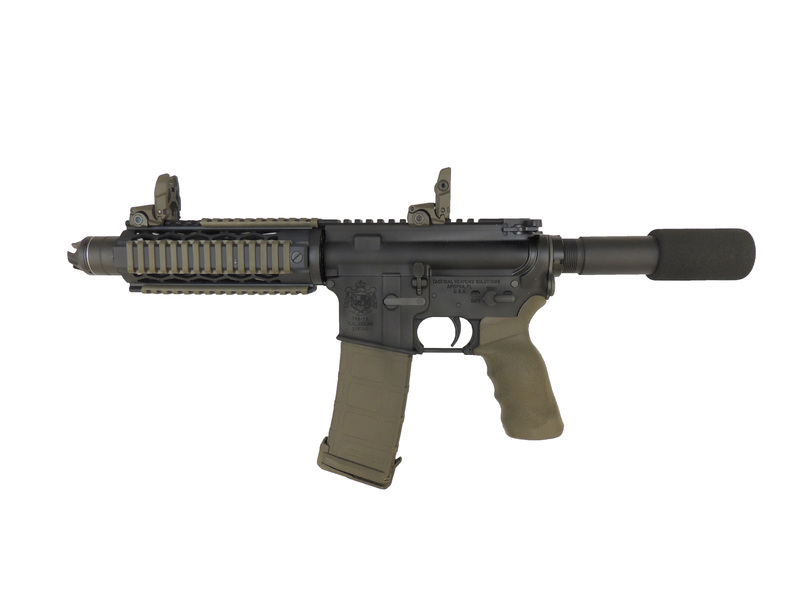 An AR-15 ‘pistol’ differs from the rifle version by having a short barrel, less than 16 inches and no shoulder stock. It is the functional equivalent of the rifle version. This not a traditional handgun that fits in a belt holster. It is in no way a concealable weapon, except for perhaps a tall, lanky man in a trench coat. Such rifle ‘pistols’ exist because of the quirky 1934 National Firearms Act (NFA), which strictly regulates rifles with barrels less than 16 inches in length. Originally, the NFA was to ban handguns, and to prevent citizens from creating concealable weapons from rifles by cutting their barrels down, short barrel rifles (SBRs) were banned. Any rifle that is designed or intended to be fired from the shoulder is an SBR, requiring extensive paperwork, a background check, fingerprints, and a $200 tax stamp. The 1934 NFA was a measure in reaction to the Prohibition Era gangster murders (such as the Tommy Gun St. Valentine’s Day Massacre) and severely restricted several types of weapons. Machine guns, short barrel rifles, short barrel shotguns, disguised weapons, and suppressors (silencers) were subject to registration and a $200 tax stamp. In states where such weapons are legal today, $200 doesn’t sound like much. However, in 1934, $200 would be roughly equivalent to $3,500 today. The intent of President Roosevelt and the Congress was to regulate firearms by means of taxation. An SBR in other terms, this would be a carbine, originally a long-gun, shorter than a rifle or musket, generally used by troops on horseback. The standard issue US military rifle is the M4 carbine—a fully-automatic version of the civilian AR-15 with a 14.5 inch barrel, short enough that even though it is too long to be concealable, it still requires registration. Since most gun owners who want a short barreled rifle do not want to jump through the hoops of registering an SBR or pay a $200 tax on their 2nd Amendment right, they turn to these rifle ‘pistols.’ Federal law considers a firearm that is intended to be fired from one hand a handgun, as long as it doesn’t have a shoulder stock. So by removing the shoulder stock and adding a shorter barrel (usually from 7 to 11 inches), an AR-15 rifle can become a pistol and thus avoid being an SBR. By no means is this a traditional pistol. It is a ‘pistol’ by convoluted definition only. A short barreled rifle and rifle ‘pistol’ are the same thing, just dressed differently. Since the ammunition is actually intended for a rifle, and not a pistol, it cannot and should not be construed as pistol ammunition. Rifle and pistol cartridges overlap all the time. There are 9mm ‘carbines’ that fire the same cartridge as a pistol, but the carbine is the size and configuration as a rifle. Or take the .22LR rifle cartridge , a popular staple of shooters and the rifle most Boy Scouts shoot. Since this “long rifle” (LR) cartridge can be fired from a wide variety of pistols, it is classified as handgun ammunition and cannot be sold to anyone under the age of 21! So a 19 year old with a .22 rifle must have an ‘adult’ buy the ammo for him. It’s a lot like letting minors drink alcohol, but banning them from buying it. The classification gets stranger. A rifle takes its name from spiral grooves in the barrel used to impart spin to the bullet and thus stabilize it in flight. Since a true pistol has a ‘rifled’ barrel far shorter than 16 inches, if one were to add a shoulder stock or a forward grip (so it could be held with two hands), this pistol would become a short barreled ‘rifle’! While I mostly discuss the AR-15 here, a wide variety of rifles can be converted into ‘pistols.’ Rifle ‘pistols’ have been around for a long time, including AR-15 ‘pistols’, which have been on the market since 1977 in different forms. As discussed before, specialty pistols (usually competition guns) also fire rifle cartridges too. The federal government and the ATF are responsible for the definition of these rifles as ‘pistols.’ They are not super powerful pistols firing a ‘magic’ armor piercing cop-killing bullet. They are short rifles firing rifle bullets defined as ‘pistols’ thanks do a bad law (the NFA). The ATF’s assault on the AR-15 reaches no limit. We are talking about the agency which declared that a shoelace, applied correctly, could turn an ordinary semi-automatic rifle into a machine gun. The ATF also recently declared that an arm brace, if held up to the shoulder like a shoulder stock, would turn a ‘pistol’ into an SBR. The arm brace was designed by a veteran to help these pistols shoot more accurately. Being rifles in actuality, they are front-heavy and tend to want to lean forward. This was a huge problem for disabled shooters, especially those missing one arm who could not grasp the front hand guard of the ‘pistol.’ The solution was to have a polymer arm brace that went over the forearm and was held in place by a Velcro strap. Now, by either design or unintentional resemblance, the arm brace could be held to the shoulder like a stock when fired. This is where the problem with the ATF began. 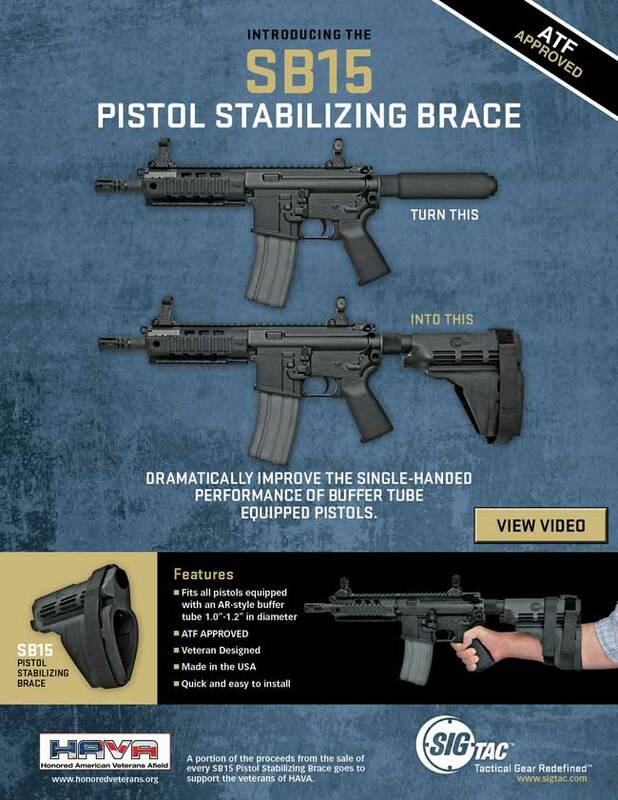 First, the ATF certified to the manufacturer, Sig Sauer, that their SB-15 arm brace did not turn a ‘pistol’ into an SBR, even if fired from the shoulder. Their reasoning was that it was only a stock if it was designed or intended to be a shoulder stock, not something else entirely repurposed by the end user. Then the ATF changed its mind, saying that the ‘pistol’ probably became an SBR if the user held the shoulder stock to their shoulder and fired in some sort of insane transmutation, which is why they recommended people not do that. Rather like saying that it’s legal for minors to buy alcohol, but only if they don’t intend to drink it. Finally, the ATF made its final determination that the arm brace made the ‘pistol’ into an SBR if the owner installed it with the intent to fire the ‘pistol’ with the arm brace against the shoulder like a rifle. As long as the arm brace was meant just to be an arm brace, it was perfectly legal. It was all about the end user’s intent. This doesn’t make sense. First the ATF says the regulation comes from design and intent, not how the product is used, then says intent turns a rifle ‘pistol’ into a rifle again. I would like to clarify that a short barreled rifle or rifle ‘pistol’ isn’t any more dangerous than any other rifle. A short barrel or an arm brace to the shoulder doesn’t make it more deadly, turn a semi-automatic into an automatic, or warp the mind of a law-abiding gun owner into a murderer. Update 2/20/2014: Sig Sauer clarified in a press release that their arm braces are indeed legal to install on pistols. Their press release seems to be clarifying the point that an arm brace used as an arm brace and not held to the shoulder as a makeshift stock is still legal. The ATF’s ‘proposed’ ban is based on the idea that there is no sporting purpose to the cartridge. Since it is armor piercing, and armor piercing ammunition is for killing people (as animals don’t wear Kevlar), it can’t be for hunting, goes their logic. Yet this round is preferred for hunting. In states such as California, lead bullets are prohibited for hunters, due to the concern of an unrecovered animal carcass being eaten by predators, specifically the condor, and causing lead poisoning. The scientific argument for these laws have been shown to be dubious. Hunters of feral pigs, known as wild boar or javelinas, prefer this round because it will easily penetrate the undergrowth that might deflect a lighter bullet in the dense brush the feral pigs prefer. A heavier bullet increased penetration and makes a more humane kill in animals with tougher hides than lighter bullets. Heavy bullets fly further, straighter, and are more accurate than standard lighter rounds. This is why ‘match’ rounds are generally heavier. In fact, the standard .30-06 M1 rifle round of WWI era was switched to the M2 Ball round, a cartridge with a heavier bullet intended for machine guns, around WWII because of much better performance. This round is the preferred round in competitions using surplus US military rifles and is known as ‘match’ ammo. Both hunting and match ammo is heavier and differently composed than military standard rounds or practice ‘plinking’ ammo. There is indeed a sporting purpose for such a round as the M855 and other ‘armor piercing’ rounds. Cheap, military surplus ammunition is a staple of civilian target shooters and hunters. Since the US military upgraded from the M855 cartridges to the improved M855A1 cartridges, millions of surplus cartridges are available to the public at discounted prices. New manufacture also accounts for large portions of the ammunition business. This round is literally the most popular single cartridge design in America today. Americans do not deserve to lose access to cheap ammunition that is environmentally friendly (some versions) because of politics. As I have shown above, this round is not inherently any more dangerous than any other rifle round. These rifle ‘pistols’ are only classified as handguns because of arcane laws an logic only a lawyer could love. Arm braces don’t magically make a gun more deadly or switch a ‘pistol’ into a rifle because of the way someone holds it. Criminals are not using AR-15 'pistols' wide and free to cause mayhem or assasinate police officers and they do not use this so called 'armor piercing' ammo for the same ends. Most rifle caliber ammunition of sufficient velocity will penetrate police body armor. "ATF inappropriately places the focus on how criminals might misuse sporting ammunition in a handgun. This ruling and others like it are arbitrary, capricious, and pays lip service to due process. It is nothing more than political theater and President Obama’s revenge against gun owners. It is also curious that this ban comes at a time when a congressman has proposed banning the sale and possession of civilian body armor. This ruling and the ban on armor piercing handgun ammo, in this case applied to rifle ammunition, along with the reclassification of the arm brace, is a significant infringement on the right to keep and bear arms. Tell the ATF they have it wrong by emailing them at APAComments@atf.gov and don't forget to tell your congressman and Sen. Heller (I doubt Sen. Reid would care).